The Dragon Alphabet is the alphabet used for the Dragon Language. Text written in the Dragon Alphabet is found on walls in ancient dungeons and on burial grounds in the form of Word Walls. The alphabet consists of 34 symbols: 25 that map directly to letters in the Latin alphabet, and nine that represent pairs of letters. There is a symbol for every letter in the Latin alphabet. The letter "C" does not usually appear, due to the fact that the letter is unused in the Dragon Language. See Legends Card Packs below for details. Coincidentally, this poem is also the song that is heard throughout the game when the player enters combat with a dragon or if the player lets the game run on the main menu without selecting an option. Originally known as "Dragon Poem", it was revealed through the in-game book Songs of Skyrim that this is only a portion of a longer work. Loading Screen text name the work Song of the Dragonborn. 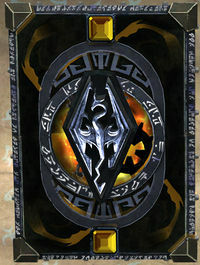 The full version, in both English and the Dragon Tongue, can be found in Songs of Skyrim. "Sovngarde" is the Nordic idea of the afterlife, a part of Aetherius. 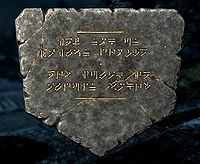 The same text appears on the dragon wall statue included with the collector's edition of the game. This is also the text for the first Word Wall for the shout Storm Call. This is the only instance of the letter "C" in the Dragon Alphabet. A Dragon font containing all known characters is available for download.